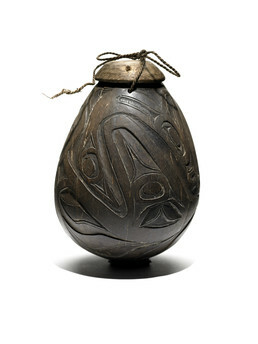 This seamless tobacco box is made from a coconut, an exotic item that could have washed ashore on the British Columbia coast after drifting across from Asia on the Japanese Current. Alternatively, it might have been brought by an American fur trade vessel that had called at Hawai’i or other South Pacific port on its way north. The Tsimshian and neighboring coastal peoples cultivated a species of native tobacco before Western contact, mixing it with seashell lime for chewing.